SURVEY: Are you talking politics in the workplace? | Challenger, Gray & Christmas, Inc. Regardless of where you stand on the political spectrum, there is no denying that politics today seem more divisive and contentious. This contentiousness can easily spread into our personal lives, as we exchange views on the issues and the candidates with friends, family and co-workers. 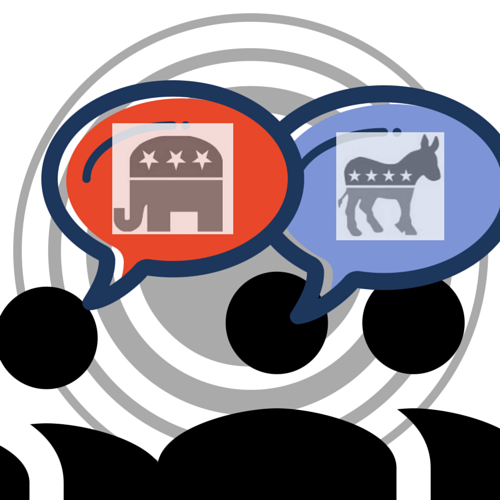 We are curious to know whether political discussions are common in your workplace and how they may or may not be impacting productivity, employee relations, etc. In addition, we are hoping to gain some insight on whether the 2010 Citizens United ruling by the Supreme Court might have changed how companies communicate political information to employees. Prior to 2010, employers were banned from using corporate money to endorse and campaign for political candidates, including urging employees to support specific politicians. However, the Citizens United decision ended this ban, allowing companies to send letters and information packets to employees suggesting how they should vote in elections.